Even in an age when serious talk of killer robots is reaching as high as the United Nations, there are counter arguments and enthusiasts: Japan has just set up an organization promoting robots, and it promises to transform the world. The idea comes from a perceived need for such tech in various private sector fields, claims the Robot Revolution Initiative, which is joined by over 200 Japanese brands, including Toyota, Honda and Panasonic, according to the Japan Times. A long list of institutions is also on board. Robots could offer extensive benefits in academia, agriculture, medicine and other industries, including the disability sector. Shinzo Abe’s government stands at the forefront of all this. The prime minister, speaking at the inaugural meeting of the Initiative on Friday, promised the world a robot revolution, with Japan as its launchpad. Nothing sinister, though – Abe believes robots are key to propelling the economy forward. The idea could come to fruition as soon as 2020, with the PM pledging to expand the size of the robot market from the current 600 billion Yen (approx. $5.34 billion) to some 2.4 trillion (just over $20 billion). To galvanize Japan’s economy further, last year Abe expressed a wish to hold the first-ever robot Olympics in the land of the rising sun in a matter of just five years. Japan is, by popular opinion, the most robot-savvy nation, and it’s no surprise. Since the 1950s, love for machines has engulfed the nation and embedded itself firmly in the Japanese psyche. And it wasn’t just vacuum cleaners either. Robots were beginning to be imagined as companions as well. READ MORE: Domestic pets to be replaced by robotic imposters by 2025? According to the IO9 website, a survey conducted in 2007 revealed that 40 percent of the nation’s women in their 20s and 30s actually talk to their computers. Another 10 percent give them names. The nation is already crazy about robotic domestic pets, and one Australia-based researcher predicts we’re going to get anything from mechanical dogs to baby seals popping up within the next 10-15 years. "Pet robotics has come a long way from the Tamagotchi craze of the mid-90s. In Japan, people are becoming so attached to their robot dogs they hold funerals for them when the circuits die," Dr Jean-Loup Rault of the University of Melbourne wrote in a paper published in the Frontiers in Veterinary Science journal. 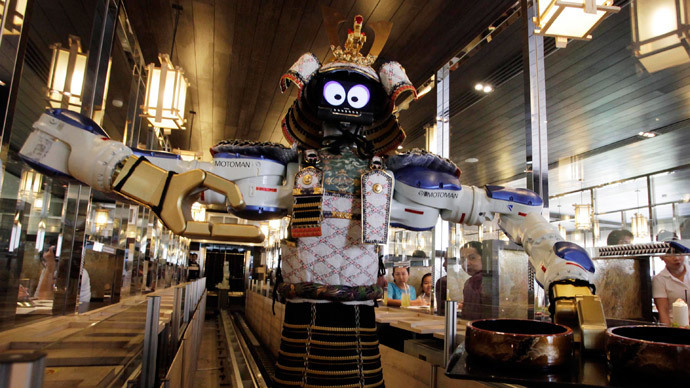 Technology permitting, it’s a sure bet the Japanese will embrace the coming robot revolution.